What the Miami Gaming Authority thought about playing 13th Age and what we liked and didn't like about the system. Take with a grain of salt, as the game is only in playtest form. 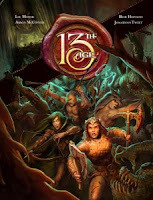 13th Age is written by Rob Heinsoo, Jonathan Tweet, and the folks at Fire Opal Entertainment and Pelgrane Press. Our thoughts and feedback to follow shortly. Join in the discussion on our forum! I really enjoyed listening to all of the 13th Age actual play and this final discussion on the system was a great capstone to that experience. The best thinkg about listening to your actual play and subsequent discussion was that you run a table of gamers with whom I wish I could sit down and play. Unfortunately the DC Metro area is a bit far of a commute from Miami. This series was very engaging and has confirmed for me my interest in 13th Age (I am currently backing the 13 True Ways Kickstarter to get both the game and the supplement). The audio was also clear and well produced. I was able to pick up everything said, except for a few moments over the series where people spoke over each other. However, that added to the "you are there" feeling rather than detracting from my enjoyment of the recordings. Thanks for doing this. I am now a fan. PS given that I am also a big fan of Marvel Heroic Role Playing, I think I will need to dip in and see what you are doing with your Necessary Evil mash-up. That looks like it will be very interesting! Thanks Evan, glad to hear you are enjoying our actual plays. I can say assuredly that your experience of being sold on 13th age from the playtest is a common one. I've backed the latest kickstarter myself enthusiastically. We're planning to have a roundtable between myself and a couple of other players we recorded in the next couple of weeks. 13th Age was nice as it hits our sweet spot in a lot of ways. We do tend to talk over each other a bit at times, and we have repositioned a few things to help compensate for those among us with booming voices. I'm glad that it comes off well though. 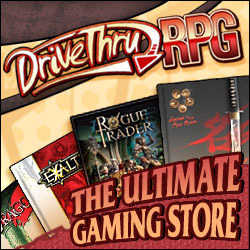 We ran the MHR/Necessary Evil mash-up for a couple sessions, then went back to Savage Worlds. This wasn't for lack of enjoyment, but it turned out many of us were more in to simulating a world with supervillains in it, than simulating the comic book structure itself. I'm still quite enamored of the system, it's one of the best systems I've seen for picking a tone and style and ensuring that all of the mechanics are in service of this goal.